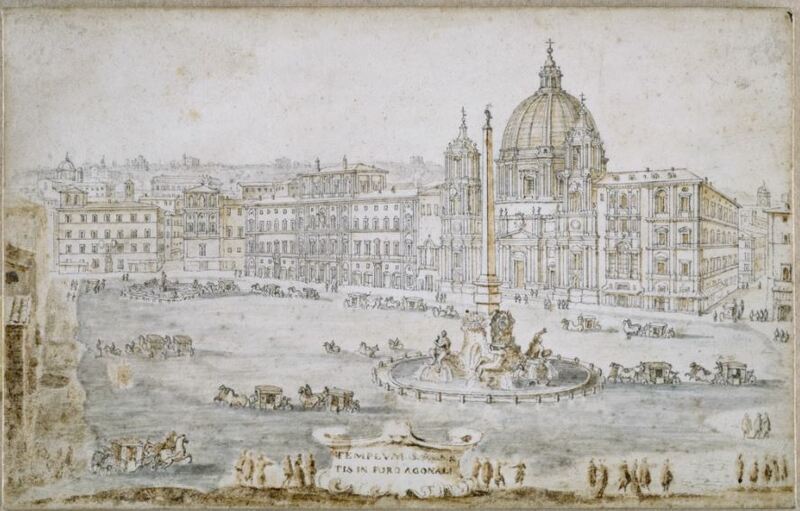 The remains of the Stadium of Domitian are in an area situated between Piazza Navona and Piazza di Tor Sanguigna, around 4.5 metres from street level. The archaeological area under the authority of the Sovrintendenza Capitolina, is all that remains of the first and only example ever found until now of a masonry stadium in Rome. The temporary wooden constructions of Caesar and Augustus, are among the rare testimonies, along with that of Pozzuoli (Naples), that are known outside of Greece and the Eastern world. The stadium’s capacity was around 30,000 according to Regionari catalogues but another calculation estimates that 20,000 would have been more probable. The structure was built to celebrate the Capitoline Agone, games dedicated to Jupiter Optimus Maximus and was an imitation of the Olympic Games which began in 86 AD when the games were established. This competition, like the Olympics took place every four years and was dedicated to Agone athletes who were of Greek origin. Other events were added that involved music and equestrian challenges. Presiding over the games was of course the Emperor wearing a golden crown with an effigy of Jupiter, Juno and Minerva, dressed in Greek fashion with a purple toga.. 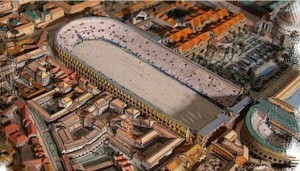 The Certamen Capitolinum was a trio of music, equestrianism and gymnastics (musicum, equestre, gymnicum), therefore the games had varying characteristics: opening games of Greek and Latin poetry that took place in the Odeon, built by Domitian close to the stadium, was where music competitions were held which included theatrical and equestrian challenges (these last examples were meant to take place at Circus Maximus, the reconstruction of which Domitian began and was then completed by Trajan) and finally the sport competitions were held on the Greek Olympic circuit: light athletics (various running races), intense athletics (fighting, boxing and pankration), beyond the pentathlon games (running, discus throw , long jump, javelin throw and wrestling). The most important event in the games was the race around the stadium (around 180 metres). 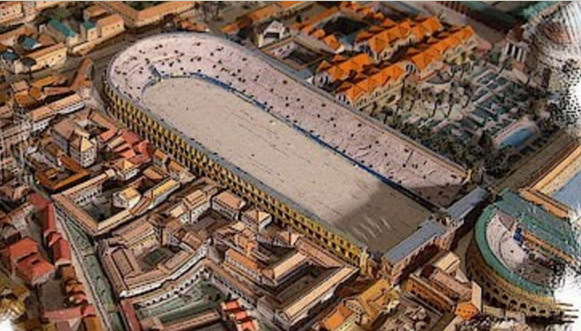 The remains of the Stadium of Domitian construction are derived from Greek architecture and various parts are preserved in the basements of Piazza Navona; these came to light in 1868, 1869, 1933-34, in 1936-38 and in 1949-50. The most noteworthy being relative to the hemicycle, uncovered in 1936-38, in the following excavations under the direction of Antonio Maria Colini, due to the opening of Corso Rinascimento following the regulatory plan of works and governorship in 1931. The remains are still visible under piazza di Tor Sanguigna, remarkably conserved, the walls of the masonry structures are one of the most representative monuments to imperial Rome. The structure is a long rectangle (265m x 106m), with an extremity in the form of a semicircle with one of the long sides being slightly oblique. The length was proportionate to that of a racetrack based on the stadium. It was built from brick and covered with moulded and coloured plaster; the façade and the interior columns and walkways were made from travertine. The track was made from compacted earth. 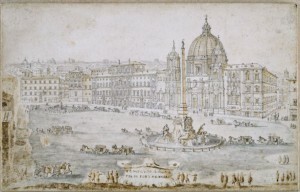 Piazza Navona was the Roman location for games and celebrations.